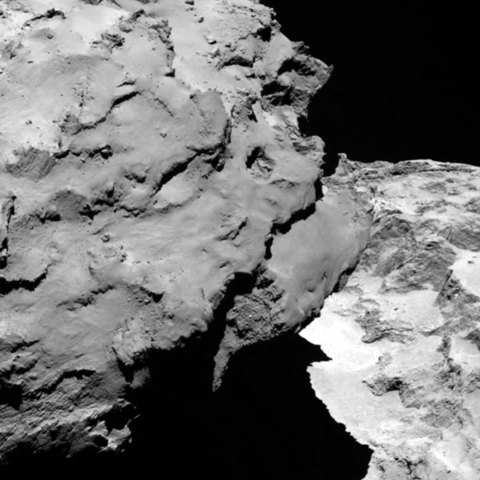 Spaceflight Now feature a couple of images of the side of the comet that we have seen very little of. Armed with this new shot I had enough to coax out some stereo coverage of the region and add to the side of my Shapemodel. I will put the new mesh online in a couple of days. It needs a little more work. Hi Mattias. 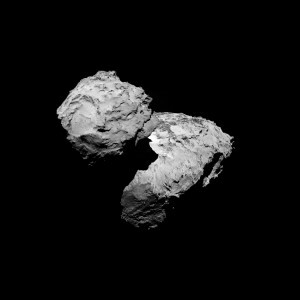 You have used the Aug 16 OSIRIS image I’m guessing and filled in the missing bits of the head, changed the view angle a bit too. Some giant ” flint knapper” had a go at both the head and the body. Those clean, flat surfaces and their identical alignment suggests something has knocked off the ends of both lobes at the same time, somehow not destroying the whole comet in the process. 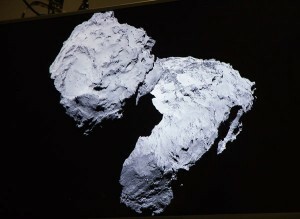 This was not at all obvious in the OSIRIS image. You clearly have some very nice toys to play with. As always your images are highly informative and brilliantly done. Thank You! Thank You for publishing the 3D model.